Given the fact that 62% content marketing professionals take website traffic as a measure of their success and 39% hold the opinion that SEO ranking of their content marketing is crucial, will you still take content marketing lightly? If the above facts have prompted you to take some action to market your content seriously, then the first step to take is to master the technique of taking your seo content to the right audience in a way that it helps you improve your website’s SEO ranking. But before you jump into action, it makes sense to ensure a user-friendly blog and website design to ensure easy navigation and convenient browsing for your users. While we do not intend to set some rules that you have to follow strictly, here we present to you seven content marketing tips to help you improve your content marketing strategy and search engine optimization techniques to stay of the curve in the year 2016. So, now when you know how you can use content marketing to boost your SEO rankings in the year ahead, let’s discuss these points in greater details. – Google has put in place some path-breaking changes in its algorithms to counter content cloaking that used to be a black hat practice to boost SEO rankings. Now marketers have no option, but to create high-quality content in order to rank their website higher on the SERPs. Google bots now analyze content relevancy when crawling through website pages. New search techniques have equipped search engines to ensure that only content that’s unique, distinctive and engaging ranks higher. In addition, with the ever-changing search algorithms of Google, long form content has become a norm rather than exceptions. Search engines rank content with word length 1500 to 3000 words when ranking a website. In addition, search engines, especially Google, prefers visual content over static content. So, it makes sense to incorporate some visual assets such as images and videos in your content for greater organic search engine optimization success. – If you’re reading this post, we’re sure you already know that you must use keywords in the title and body of the content. The keywords must not only be relevant to your business but they must also be effective enough to boost your ranking on the SERPs. To find out which keywords will help in ranking, use free search tools. Use Google’s Keyword Planner to analyze which keywords are already ranking higher on Google. But don’t get tempted to stuff your content with keywords as Google consider such content as spam content. In addition, your readers too will also not take such content kindly. Use keywords naturally and where they fit in the context. We’re sure if you’re able to take care of this, you’ll be able to demystify the phenomena of perfect SEO content. You can rely on SEO service providers like Kotton Saint Louis to deliver positive and direct results to your business. – Generally, your content has keywords placed in the title and the body part. But for better rankings, it makes sense to use keywords in you URLs too. This is because most searchers decide whether or not visit your site basis your site URL. But for that you’ll need to ensure that your site ranks well! By putting an anchor text describing your content in short, you can make your URL look relevant to both Google bots and to the users. special symbols such as dash, random letters, numbers, etc. This will ensure that your URL appears coherent for better content marketing results. Remember, there are 3.65 billion unique global mobile users, according to Marketingland. And it would be suicidal if a mobile user comes visiting your website and finds it difficult to navigate. Neilpatel states that the total number of searches on mobile devices has seen a 43% increase year-over-year. In addition, Google’s algorithm updates in 2015 ensured that mobile-friendly sites ranked higher on search result pages. Remember, visitors who get better mobile experiences are the easiest to convert. Therefore, ensure scalable font sizes to ensure that mobile users can easily zoom in and out to read the content they want on their screen. Do well to ensure site navigation to make it easy for your users to find the information they are looking for. See to it that your content has a specific, reliable URL. To ensure maximum value for your users, it’s essential that you stay away from using flash. – No matter how ravishing your site is, your site’s load time is critical to success. In a large part of the world, cellular networks are much slower as compared to the wired network connections. In fact, Usabilla.com reports that 50% users expect a site to load within 2 seconds or less. Remember, faster load times can help you site rank higher on SERPs. In order to boost your load time, you’ll need to optimize your content for compression. The location of your largely depends the load time, it makes sense to spread your content across servers. In addition, you can also use a content delivery network (CDN) for the same. Web Designer Depot explains that a CDN can drastically reduce server lag by storing static resources on a network of fast loading servers. – If you are not actively promoting your content, it will not be visible to your target customers. For better promotion, a crucial online content marketing tip is to reach out to influencers in your field. Find out influencer websites and write guest posts for them. You can also email and request them to share your content with their social media fans and followers. – You may be using duplicate pages for allowing a printer friendly version of your site pages or to track clicks, but these may be a hurdle in ranking your site higher. Instead, redirect the users from your duplicate pages to the right pages. To do so, place [‘’rel=’’ canonical’’] tag within your HTML code. So, there you have it! 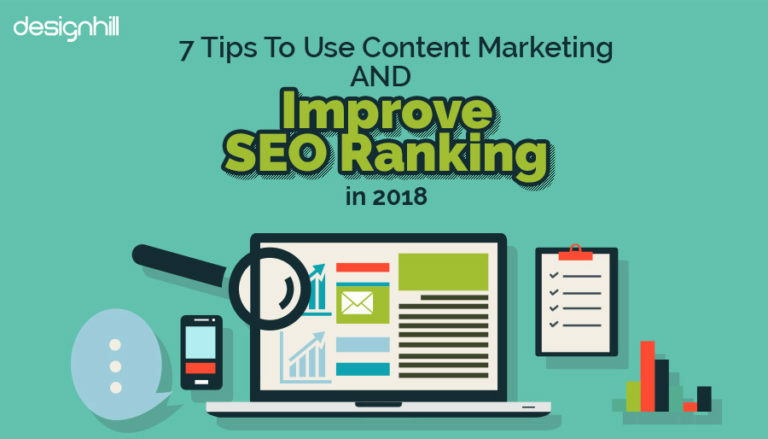 These 7 easy to follow tips will help you use your content marketing strategies in way that you’re able to boost your SEO ranking. As always, please share your thoughts in the comments, if you enjoyed this post, please share it on twitter and spread some love! Don’t hesitate to hit me up with any questions, critiques, or feedback. Looking for a mobile-friendly website to boost your business amongst mobile users? Simply launch a website design contest today and get to choose from 100+ responsive, creative and user-friendly websites designs. We offer a full 100% money back guarantee! Finally, a risk-free way of getting a custom logo design.